• Healthy seasoning with the finest, natural ingredients – Kombu, Bonito extract powder, Tamogitake mushroom extract, Shiitake mushroom extract, etc. • Give your soup or vegetable dish a flavorful boost with this healthy seasoning! Using the finest ingredients, Umeken has developed Takumi, a new generation of healthy seasoning and stock powder. Use it for any soup or vegetable dish and taste the difference! Bonito Extract Powder – Yaizu bonito (fish) from Japan's Shizuoka Prefecture, rich in protein, Vitamin D, niacin, and, taurine. 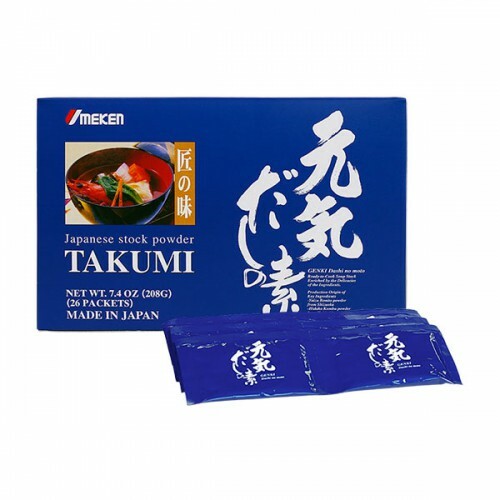 Tamogitake mushroom extract powder – Very rare ingredient in a seasoning, contains an abundance of beta-glucan. Shiitake mushroom extract – Popular soup ingredient in extract form. Kombu – Hidaka Kombu (seaweed) from Japan's Hokkaido region.